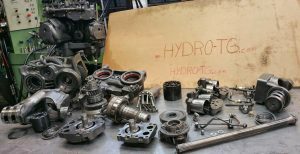 HYDRO-TG is surely the only or very rare in France to repair this type of hydraulic gearbox VARIO and maybe in the world? if one exists, there shouldn’t be many who know how to repair them.. 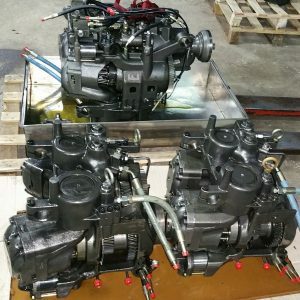 There are 2 big family of Fendt vario gearboxes, with double body ML160 and triple body, for the low and high power ML200 and ML260. 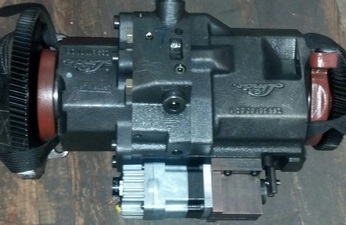 it is not uncommon that if there is a leaky safety valve or a clogged nozzle, that the vario is changed by the mechanic, to avoid this, before repair, we always put the vario gearbox in pressure before disassembly, if it is a simple repair, it is adjusted immediately, if it is necessary to disassemble, a quotation is made for approval. Before we deliver them, ask us how to fix them on pallets, it is very complicated, otherwise there is a risk of breakage during transport. 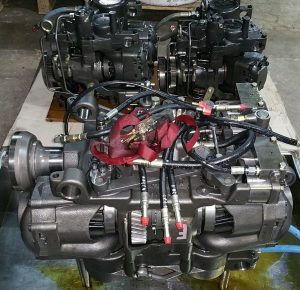 This type of hydromechanical transmissions is very complex and specific, it took me a lot of time to fully understand its operation and set up repair and testing procedures, thanks to 40 years of experience and passion in hydraulic pumps, I was able to easily take up the challenge. 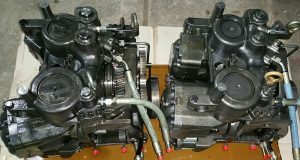 The VARIO hydraulic continuously variable transmission was invented by the tractor brand FENDT in the 1980s, this innovative hydro-mechanical transmission was introduced by Fendt in 1996. At low speed the transmission is 100% hydrostatic, i. e. an enormous torque and maximum speed at 100% mechanical, which allows an excellent efficiency, the hydraulics allows a perfect progressivity and without any kinks. 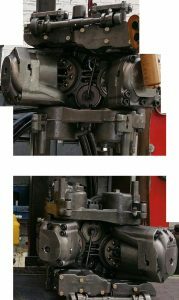 The trick is the use of a planetary gearbox coupled to the hydraulic system, it is the very clever basis for the operation of the transmission. when the hydraulic pump is in neutral no movement is made. 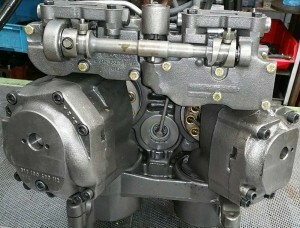 when the motor is zero displacement, (which never happens on a conventional hydrostatic transmission) at this time the flow rate of the pump can no longer circulate and blocks the hydraulic pump, which blocks the crown. At this point neither the hydraulic pump nor the hydraulic motor creates or absorbs flow, except internal leaks. 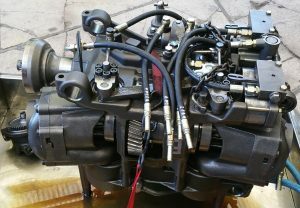 the diesel engine drives the wheels only mechanically and no longer in hydrostatic transmission at all, it is only and directly mechanically 100%. Another innovation on this hydromechanical transmission is the hydraulic pump tilt from 0° to 45° for forward travel and from 0° to 30° for reverse travel. there’s road and work speed and lots of other important little details. this combination of pump and hydraulic motor is much less complex. 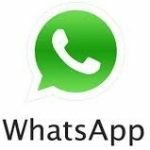 box reparation fendt, continuous variation fendt, continuous variation fendt tractor, fendt 818, fendt 820, fendt 828, fendt gearbox reparation, fendt gearbox tips, fendt massey JCB gearbox, fendt problem gearbox, fendt reparation, fendt serie 800, fonctionning fendt, fonctionning gearbox fendt, gearbox refurbishment, technical sheet fendt. Favori.